The ad buying system has become more competent and cost effective ever since programmatic advertising took over the digital market. 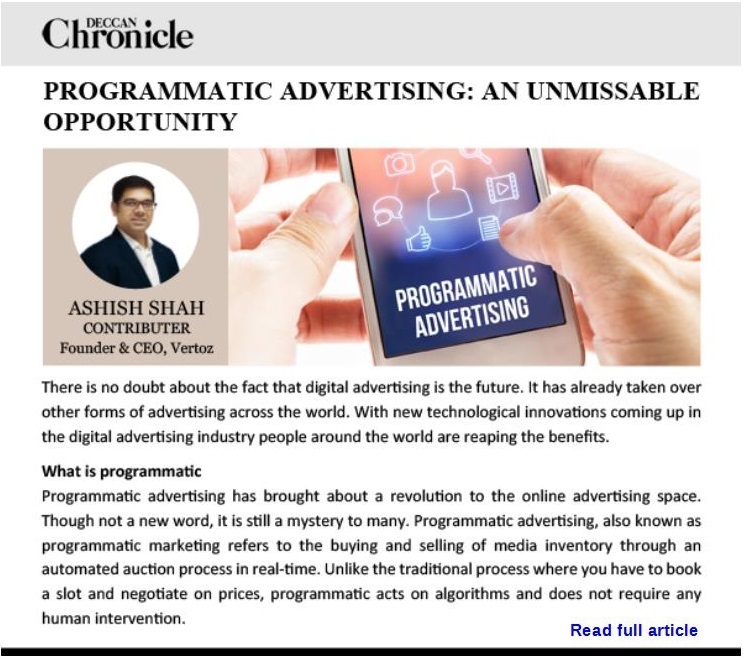 In this article, our CEO, Ashish Shah explains, how programmatic advertising is helping to resolve a lot of hitches for advertisers who want to endorse their business and have a superior influence. Programmatic advertising introduced a revolutionary element into the online advertising space. Though not a new word, it is still an unknown concept to many. As we all know programmatic advertising, also known as programmatic marketing which refers to the buying and selling of media inventory via an automated auction process in real-time. He explains that how for publishers, programmatic is making their websites yield more returns. Brands will soon start embracing programmatic and will receive advantages from it and in future, it will maximize demand for publisher inventories also. It is owned and managed by Deccan Chronicle Holdings Ltd. DCHL’s flagship print brand Deccan Chronicle is published from Hyderabad. The Deccan Chronicle has a loyal reader base that appreciates them for their daily news on current affairs, politics and business. They also focus on society, art, culture, films, etc. Their dedicated team of journalists evolves with the readers’ needs, considering their desire for information, delivering them with the tools that can keep them ahead in their professional and personal lives. Vertoz being a leading programmatic company offers engaging and innovative advertising and monetization solutions. This year we are not just escalating financial growth, rather it will be technological along with financial growth. We as company monetize traffic from all verticals and geographies to safeguard the best ROI for our valued customers. Our well organized and strategic traits include premium traffic quality, precise targeting, real-time tracking and detailed analytics.